I was at the Dollar Tree today and ran across these vintage looking striped glasses. It was love at first sight. 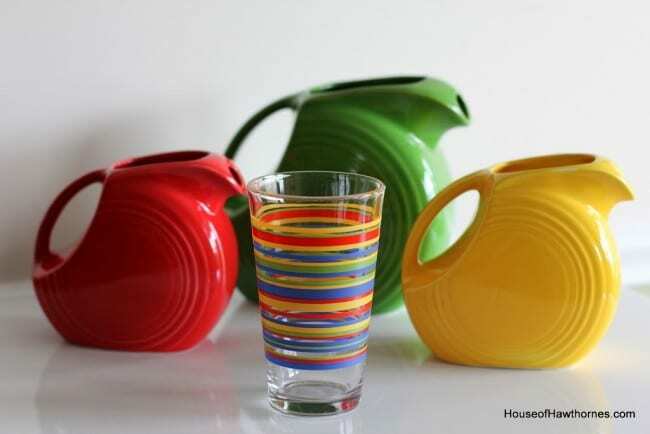 My first thought was that they would go perfectly with my Fiesta Dinnerware! And guess how much they were? $1.00 each. I’d show you the animal crackers I bought also, but you probably know what those look like (they were $1.00 too, just in case you were wondering). What did I ever do before they invented dollar stores? Previous Post: « Croquet Box Anyone? That is so funny Pam, I just saw those yesterday and almost bought them..then I thought, geez more glasses where am I going to put them. They are so pretty. Aren’t these awesome??? I got them 10 the last time they had them…I picked up two more just in case….these are all of the colors of Fiesta that I have…..you cannot beat 1.00 !!!!!!!!!!! Fiesta glasses have an orange ring, and I don’t have orange in my color scheme, and they are 10.00 a piece! Oh my gosh – those ARE cute, and they DO go perfectly w/ your Fiesta Ware! Perfect! Aren’t those fabulous. They truly are perfect with your Fiesta Ware. Awesome deal! Oh. Gosh. I don’t think I can get there fast enough!! I did not see these last time I was there. They are so cute! Those glasses match your Fiesta Ware perfectly. What a good find. You can’t beat the prices at a Dollar store. GREAT deal. ENJOY! Those glasses are perfect with Fiesta ware! I love the dollar store! Perfect match for your Fiestaware! is!! Looks so amazing. I saw those glasses. Got to love the dollar store. Oh my! Love those stripy glasses! You made a wise choice. 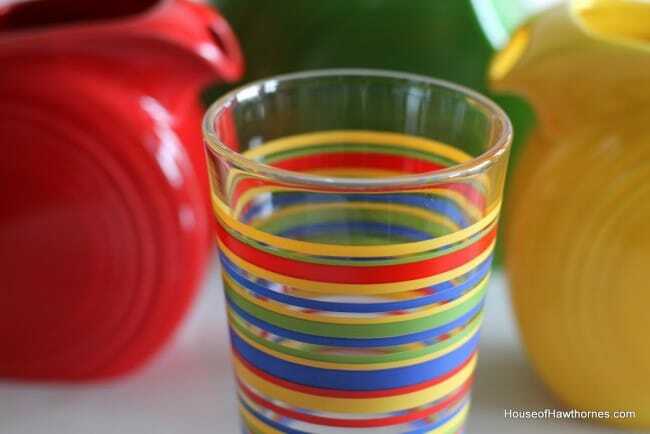 These glasses match your dishes perfectly. I love the Dollar Tree….and I really don’t know what we did without them….but I still know some people that won’t go into them….their loss! I love the Dollar Tree too, I saw those and I love them too! I usually get chocolate covered raisins! Pam they are the perfect glasses for your collection! You never know what you will find at the Dollar Tree! They work perfectly! Amazing what you can find at the dollar store. I picked up some vintage looking Coca Cola mugs. Love that store. Great glasses! I bought some a few weeks ago and will be sharing them in a tablescape soon. The do go perfectly with your Fiesta ware. Love the way you photographed them together. They are perfect with your Fiesta Ware. I love all the colors. Did you buy them out? Great find, they look wonderful with the Fiesta. My dollar buy is junior mints! I saw these glasses too at our dollar store and it’s so colorful. They are so nice and colorful and they look sturdy! I don’t have a dollar store near me. I guess I should find one! I need a dollar store. I’m so jealous. that we are selling at our little antique shop! Love your new vintage-style ones even better…. seeing as I don’t do shots!!!! I love the plates mthat go along with these!! Saw these at $ Tree the day after you posted this. Thought of you! Too cute. I have an overabundance of glassware, so they didn’t come home with me. Hey, your photos are looking really good, Pam! You just never know what you might find at the dollar store….. The glasses are really cute!